Yep. This post isn’t my usual wine post, LOL. You guessed it, and it’s another one of my marshmallow critters. As I had mentioned in my recent Marshmallow Ladybugs post, this was inspired from my time in the garden. I couldn’t help offering this fun Marshmallow Bumblebees Recipe. The garden can offer up some fun and cool creative ideas, i.e. these Marshmallow Bumblebees. They’re easy, and oh so fun to make. All they take is a few ingredients, a bit of time and don’t forget to add some friends to the mix for laughter and fun. Whatever you choose, I guarantee you’ll have a great time. Step One – For the wings, roll out the white fondant. Cut an oval out of the rolled white fondant with the 1 ½ inch cutter. Cut the oval almost in half. Round one end of each piece with a sharp knife. Set aside to let the wings dry until stiff. Step Two – On Silpat or parchment paper, use a rolling pin with spacer bands to roll out the yellow fondant to about 1/4 inch thickness. Step Three – For the body of the Bumblebees, place a marshmallow on the piece of the rolled out yellow fondant and cover. Cut off any excess and tuck the ends under the base of the marshmallow. 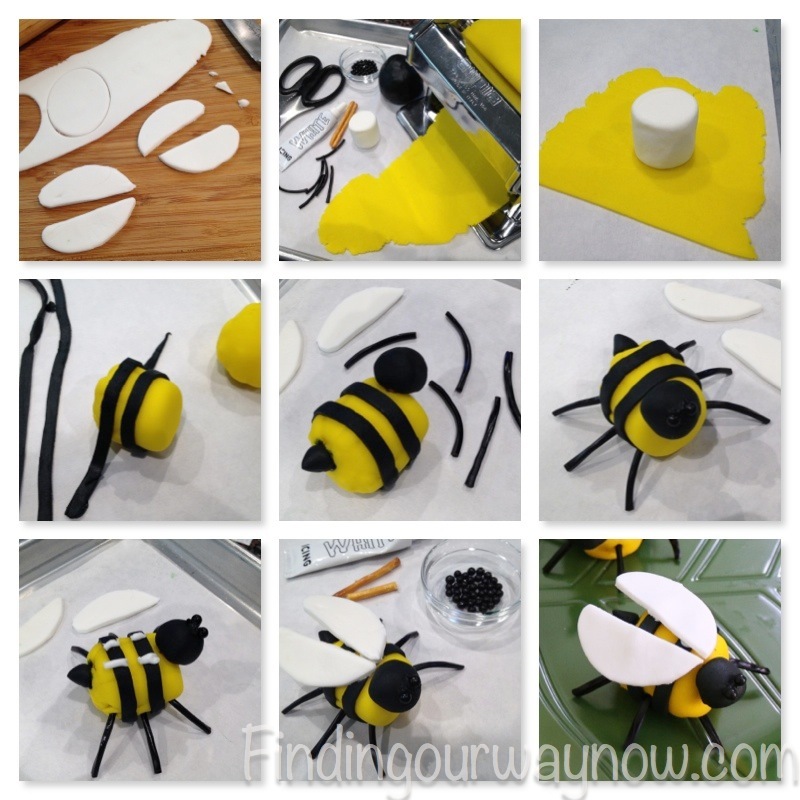 Step Four – For strips on the Bumblebee body, roll out black fondant to a ¼ inch and cut two ½ inch strips. Wrap around the yellow over marshmallow, overlap the strips cut off any excess and secure the ends with a dab of black icing. Step Five – Roll a small ball of black fondant to create the Bumblebee head. Insert half of a pretzel stick into the small ball. Using a toothpick, create a hole and then gently connect the head to the body of the Bumblebee. 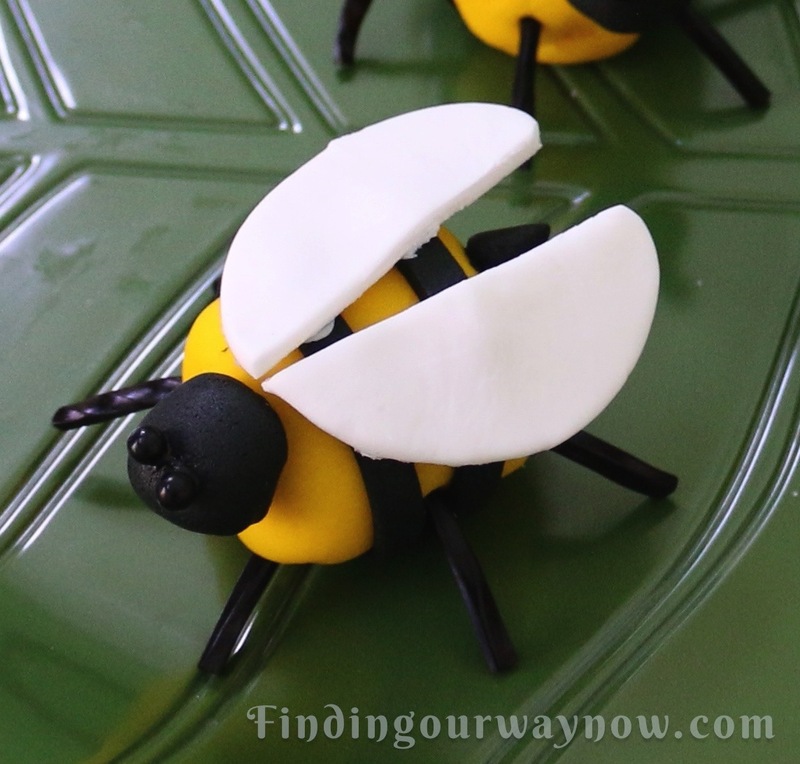 Step Six – For the bumblebee stinger, use a small piece of black fondant to create a small wedge, flatten the end and secure it to the body opposite the head with a dab of black icing. Step Seven – For the legs, gently insert six 1 inch licorice string pieces, 3 on each side of the bumblebee’s body. Now set the body on its legs on the sheet pan. Step One –We need to add the eyes. Place two small dabs of black icing on the head and then top the icing with the black pearls. Step Two – Now the finishing touch. To place the dried wings, place a few dabs of white icing on top of the Bumblebees body and place each wing at a slight angle just behind the head. Gently press to secure. Step Three – Repeat until you run out of fondant or other supplies. Now you have some cute edible Marshmallow Bumblebees. Notes: I find that using a pasta maker to roll out the fondant gives me a consistent thickness in a hurry. I also set the same pasta maker on the fettuccine setting for an easy way to create the black stripes for the body. If you don’t have one of these, you can use a ruler or rolling pin bands and a knife. You can decorate your Bumblebee’s body any way you want, I call them magical bees, so have a little fun. I use pretzel sticks as a connector so that the whole thing is edible and for everyone’s safety. I always like to use a sheet pan lined with parchment for easier assembly and cleanup. 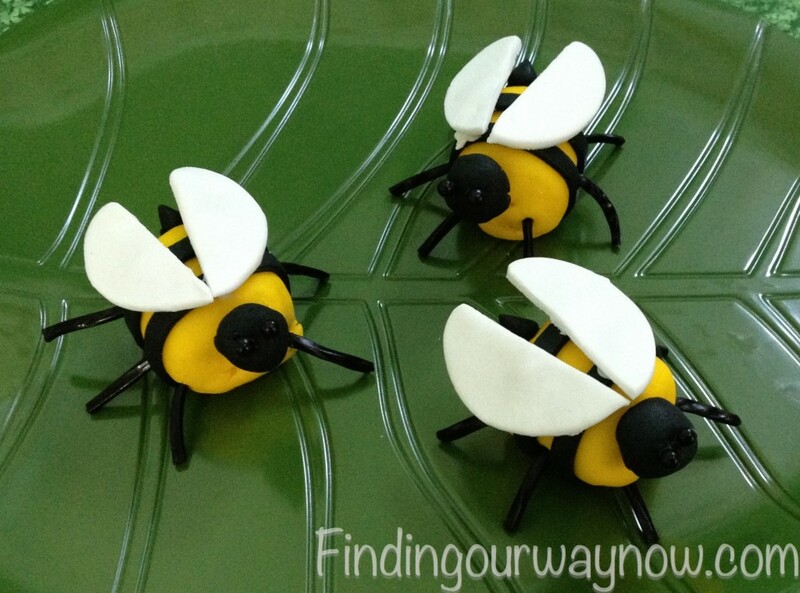 I had fun creating these Marshmallow Bumblebees. I know they would be great fun for any size kid. They are especially fun to make and share with my friends. As it is with all my other marshmallow critters, these little guys aren’t hard, just follow the instructions and you can be a marshmallow bumblebee maker too. What the heck, make up a bunch of packages with all the ingredients, a bit of ribbon along with a set of instructions and give them to your neighbors, colleagues and your family of course. Better yet, use these same packages for a fun project with friends. Enjoy.